Sometimes we want to update our Facebook status in Punjabi or write something in friend’s scrapbook in Punjabi in Orkut. But we don’t know how to type it in Punjabi. It’s also very common question among Punjabi internet users “How to type in Punjabi online?“. Today I came across a website which let you type in Punjabi language very easily. 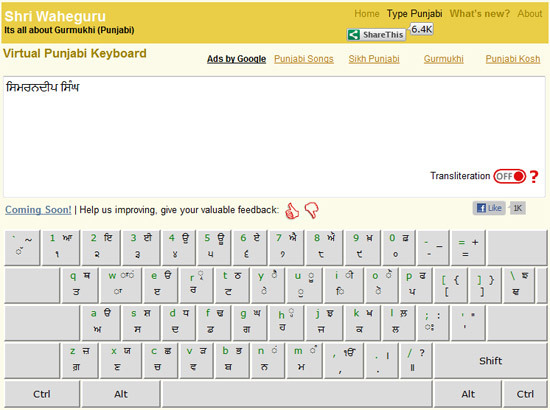 Virtual Punjabi Keyboard is an online tool to type in Punjabi. You can use the Punjabi words anywhere on Blogs, MS Word documents, Web Community Portals, your Web Profiles, etc. It has really nice interface. The Punjabi letters are written on the keyboard along with english alphabets for your convenience. So what are you waiting? Start writing in Punjabi, cope and paste it in your friends wall. Thanks 22ji eh tae bdae kamm di cheej hai. Thanks for sharing this link ). It is very easy to use & less time consuming services. I am going to use it for my blogs, facebook account and everywhere. You can also go to http://www.Quillpad.in and write in punjabi ar any other Indian language.